Soap Popsicles-Click to See More! 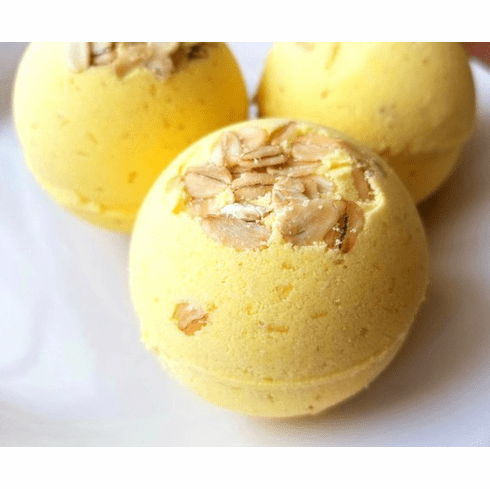 Indulge yourself with this relaxing bath bomb that is Scented in a scrumptious oatmeal honey fragrance and is infuses with oatmilk, goat milk, coconut oil, and almond oil. Bath bomb weighs approximately 5 oz. Ingredients: baking soda, citric acid, corn starch, goat milk, epson salts, oatmeal, coconut oil, almond oil, fragrance, witch hazel, mica colorant. Note: These bath bombs contain no detergents and will not bubble, only fizz. Copyright � 2012-2019 The Little Soap Store All Rights Reserved.